Soak chickpeas for 8-9 hours. Pressure cook for 6 whistles. You can use even canned beans. Drain water and keep it aside. Don’t throw the water. 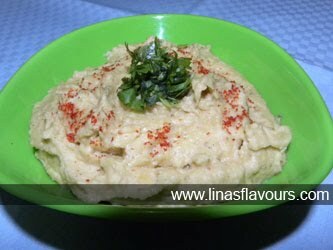 Add tahini, garlic, lemon juice to chickpeas and blend it with a blender. Add salt, cumin powder, parsley, olive oil and mix it well. If it is too thick then add 2-3 tablespoon of curd or the reserved water as per the need to blend it smoothly. Blend it to mix all the ingredients properly. Take out in a bowl. Garnish it with parsley, olive oil, red chilly powder and serve it with pita bread, fritters or any Indian bread. Note: For creamy consistency you can add 1/2 cup of curd while blending.